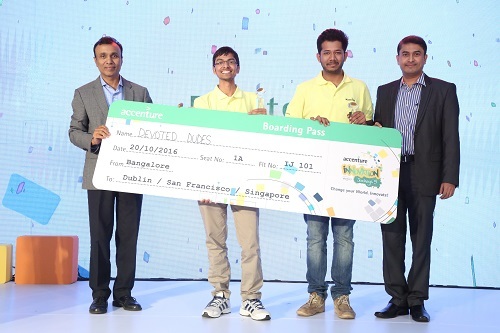 BENGALURU, India; October 25, 2016 – Accenture, in partnership with Yahoo, announced the winners of the fifth season of #Innovation Jockeys, the hunt for India’s most ‘Innovative Minds’ at the Grand Finale round of the contest held in Bengaluru. This year’s Innovation Jockeys contest was focused on finding the most promising technology innovations in three categories – detecting fraud and preventing business malpractice, creating an inclusive digital India, and empowering women – which could help drive a positive change in society. The contest was open to students pursuing undergraduate, graduate and post-graduate courses in India. The intense competition received 3,600 idea submissions from 800 campuses across India, of which the top 16 entries were evaluated in the Grand Finale round. Accenture also conducted a fast-track selection process for eligible students at the Grand Finale round. Students selected from this process will shortly receive offers to join the Accenture workforce in India. Grand Prize Winners of Accenture Innovations Jockeys Season 5, Team ‘Devoted Dudes’ from BITS Pilani felicitated by (L) Mohan Sekhar, Senior Managing Director, Technology — Delivery Centers for Technology in India, Accenture and (R) Raghavan Iyer, Managing Director, Technology Delivery and Innovation Council lead for Accenture in India. The team won the Grand Prize for their idea SMS-based Mobile Biometric Authentication System. The Grand Prize was awarded to the team ‘Devoted Dudes’ from students of BITS Pilani. The students developed an SMS-based mobile biometric authentication system to help people in rural areas securely authenticate the services offered to them by microfinance institutions, addressing problems such as forgery and fraud, and overcoming barriers such as limited internet connectivity in rural India. The award for the ‘Innovation to detect fraud and prevent business malpractice’ category was given to the team ‘IAFC’ from IIT Kharagpur, for their idea ‘Crowdsourced Corruption Database with a layer of Artificial Intelligence’. The idea aims to provide an open platform for sharing cases of corruptions through crowdsourcing, and quickly predict, prevent and solve such cases through Artificial Intelligence. The idea takes crowdsourced data as input, processes it and provides structured information as output to fight the reported case of fraud/ corruption. The award for the ‘Innovation to create a digital India’ category, was given to the team ‘AirPure’ from IIIT-Delhi. The team devised AirPure as a revolutionary surveillance system that monitors indoor and outdoor pollution levels. Their mobile application offers a personalized health risk assessment based on data around the user’s health, gender and age. AirPure will also provide valuable data for research to help the government form informed policies to reduce air pollution levels. The award for the ‘Innovation to empower women’ category, was given to ‘Wayne Enterprises’ from CUSAT, Kochi for their idea ‘NeuroBuds’. NeuroBuds is a wearable electroencephalogram (EEG) device that acts as an interface between a user’s brain and a smartphone, and automatically detects panic in the user by analyzing brain wave data patterns and triggering an SOS call. It provides an automated and faster response time, replacing the need to manually trigger an SOS button. The Jury’s Choice award was presented to the team ‘Eyeluminati’ from students of Manav Rachna International University, Faridabad. The team’s idea ‘Griwaditi’ is an automated, non-invasive and easily accessible screening tool for Cervical Cancer. Griwaditi is a point-of-care portable imaging device which uses advanced optical techniques to produce high resolution magnified images of the cervix. It has a unique cervical cancer lesion detection algorithm to quickly screen cervical cancer. The remote diagnostic application allows images to be shared for consultation with experts around the world via a cloud-based tele-oncology platform. The Employees’ Choice award was given to the team ‘Warrior War’, from Dronacharya College of Engineering, Delhi, for the idea ‘Smart Farming System’. This idea helps farmers who lack adequate knowledge in agriculture save water and increase crop-production by automating and digitizing farming techniques. It does this by using different sensors and techniques embedded in the application. Members of the Grand Prize winning team each received an Apple MacBook Pro and an opportunity to visit either the Accenture Technology Labs (in Dublin or in Silicon Valley, California), or visit the Accenture Internet of Things (IoT) Center of Excellence in Singapore. Prizes for the category winners included Apple Watch, Bose SoundLink BT Speaker, and Amazon e-vouchers. Participants in the Grand Finale round were assessed by a seven-member Jury panel including Amuleek Singh Bijral, Founder – Chai Point; Deepak Ajwani, Editor at Times Internet Ltd.; Dr. Malati Das, Advisor – Janaagraha, and former Chief Secretary of Karnataka;Ramesh Radhakrishnan, Partner, Artiman Capital India Pvt. Ltd.; Shantanu Pathak, Co-Founder and CEO – CareNX Innovations; Prof. Rishikesha T. Krishnan, Director and Professor of Strategic Management, IIM Indore; and Dr. K. S. Sridhar, Principal, P.E.S Institute of Technology, Bengaluru.